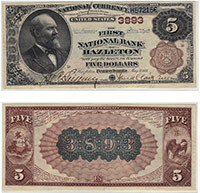 This is the highest denomination issued for the brown back series. These were printed in limited quantities. Many banks didn't have the demand for such a high denomination from the general public. Today a very generic one of these should be worth around $3,500. That price can definitely get higher based on the condition and bank of issue. Please contact us for details. Don't forget to check the serial number. Number 1 notes always sell for nice premiums.